This week has been kind of ridiculous and that's about the length of time I've had this book. So I've only had time to read the first chapter. From what I've read I can tell you that there's enough of the mannerisms and colloquial style speech of the characters to really place you in the scene, but not too much as to be distracting or overwhelming with slang you can't understand. This is a story with black main characters. I don't think we have enough of those and I'm definitely interested to read about how they were treated as soldiers during the war versus when they came home to America where there was still so much racism. Update: Okay, so the book blurb for this book is really misleading. Bernard does not go off to war until fully halfway through the book and the first half, while taking place during WWII, does not really have much to do with it. And when he comes home it's only the last three chapters of the book! If I were to write the book blurb it would talk more about how Cordelia grows up torn between her grandmother's traditions, as represented by the Pine Cone quilt, and the modern lifestyle her mother chooses. Will she choose the life of prayer and peace she sees in her grandmother, but doesn't quite believe in, or will she choose the modern independent lifestyle as espoused by her mother and girlfriends. There are some very deep themes of abuse, racism, and spiritual matters addressed. I wish the author actually had gone a little more in depth with how Cordelia changes, but overall, this was a good read. It resonated with me and I feel it falls into a category that isn't much written about in fiction. 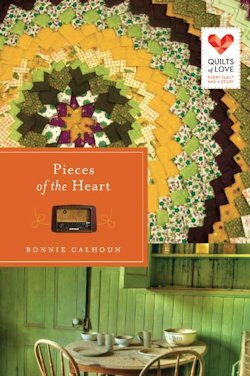 If you would like to read the first chapter of Pieces of the Heart, go HERE.